Use the form below to inquire about Plantation Bungalow At Manalar . Use the form below to reserve for Plantation Bungalow At Manalar . Let the misty mountains of Meghamalai enchant you during your cozy stay at the offbeat Plantation Bungalow at Manalar. Meghamalai translates to the place where the cotton candy clouds meet the mighty mountains. And this lesser-known hill station in the Southern Indian state of Tamil Nadu couldn’t have been named any better! When you’re in Meghamalai, you’ll see tufts of white clouds descending from the heavens above to kiss the verdant valleys quite often. A green carpet of untouched evergreen forests covers the hills of the region, which is abuzz with rich flora and fauna. You can be sure that your holiday at the Plantation Bungalow at Manalar will be nothing short of magical. The Plantation Bungalow at Manalar is nestled in the lap of nature amid the hills of Meghamalai. Every inch of the bungalow’s premises affords magnificent views of the hills and valleys around. Being located in a tea plantation, you can always see rolling hills carpeted green from anywhere in the bungalow. What adds to the mystical appeal of the property is the bowl shape of the plantation it is located on, with tall mountains on all sides. There’s also a lake that makes the place more magical. The beauty of the location is enough to kindle the nature lover and photographer in you. Solo, stag or family holidays, the plantation bungalow is an ideal location to be when you want to feel one with the sky and the earth. The accommodation at the Plantation Bungalow at Manalar is divided into two categories: a bungalow and a cottage. The bungalow has a large living room, three roomy bedrooms, a dining room, and a small library. The rooms are spacious, well-furnished, and equipped with all the modern amenities. It also has a fireplace, which is put to good use during the winters. The cottage has a living room, two bedrooms, and a dining room. Its location on the reservoir’s banks ensures that you have uninterrupted views of the lake any time and every time. With the serene nature for company, you are sure to feel refreshed every moment you spend here. So, say yes to an energizing experience amidst tea plantations, mountains, and clouds. Nature is at its grandest in Meghamalai. You can’t help but admire all the bounty and beauty it has bestowed upon this hill station. You can explore all of it by taking a walk in and around the Plantation Bungalow at Manalar. 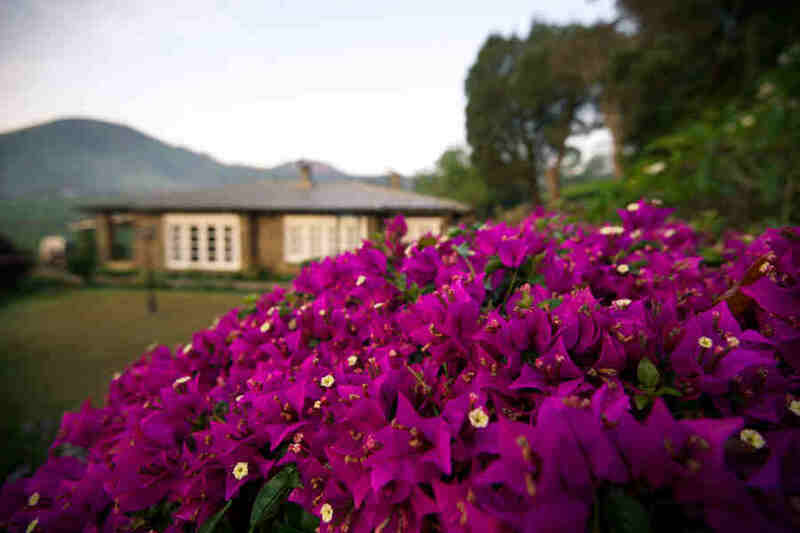 The bungalow also offers great vantage points of the 6000 acres of tea plantations that house the property. You can feel the cool breeze in your hair when you take leisurely walks in these tea gardens. There are many things to see and do in the vicinity of the bungalow too. The Manalar Dam and waterfalls, Highwavys Dam, and Cumbum Valley are some of the most popular attractions here. Meghamalai is a bird watcher’s delight and a paradise for wildlife enthusiasts. You might catch a glimpse of the many inhabitants of the Meghamalai when you explore the forests that dot the hill station. Some of the popular residents include the great Indian hornbills, grizzled giant squirrels, barking deer, spotted deer, sambar deer, smooth-coated otters, brahminy kite, red-whiskered bulbul, and many more. Once you’re done with the excursions, you can find a cozy corner in the bungalow and relax to your heart’s content. The nearest airport from Meghamalai is the Madurai airport, located 139 km away. The international airports at Trichy and Bangalore are located at a distance of about 190 km and 490 km, respectively. The major railhead from the property is in Madurai (140 km). Kadai Road (82 km) and Dindigul (100 km) are other stations near Meghamalai. As the road to Meghamalai is not in good shape, it is advisable only to travel by an SUV. It is located 117 km away from Madurai and 490 km away from Bangalore. Theni (52 km) and Chinamannur (52 km), and Rajapalayam (85 km) are some of the nearby attractions.